In this page, we want to describe how VTC commands works with an extended help and a walkthrough to register your VTC in TruckyBot. This command is enabled only to Discord administrators. 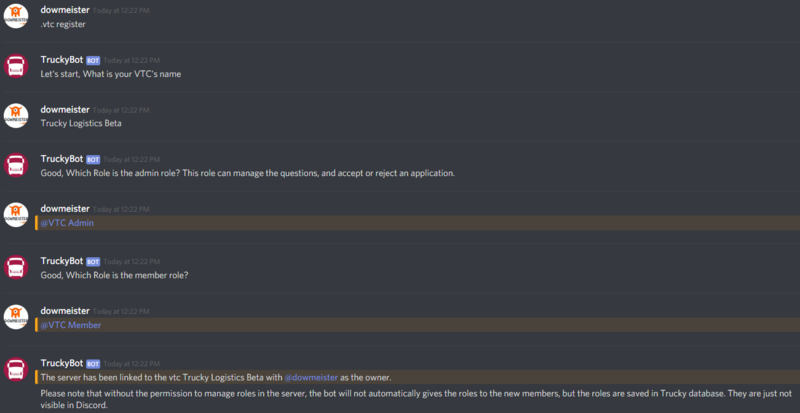 The bot will ask the VTC name, which Discord role has to be considered a VTC manager, which Discord role has to be considered a VTC member without special permission. If you don’t have these roles, you must create it before starting the registration process. At the end of the registration process, the bot will check if it has the “Manage roles” permission to manage Discord server permission automatically. Actually, the bot don't have the permission to manage roles. You have to grant “Administrator” or “Manage roles” to TruckyBot in your server. At the end of the registration process, the bot will add users belonging to VTC admin role and VTC member role as admin or members saving the data in the database. With this, you’ll unregister the VTC. The bot will assign the VTC admin role you provided during the registration process. The bot will assign the VTC member role you provided during the registration process. The bot will remove the role assigned to the user. The bot will automatically delete all the users who left the server but who are still on the Trucky’s VTC. Now you can set questions served during the application process. This command set the channel where application interview results are sent. This command is available for all users that aren’t in the VTC. It starts the application process. The bot will open a DM channel with the user and starts to serve questions saved. When the user finishes serving all questions, the result is sent in the channel set with .vtc setchannel command. The admins of the VTC can show the applications pending. And they can accept or deny the applications. This command is available to all users, show current VTC info, if registered, with admins and members list.